Britain's CO2 emissions have risen for a third successive year, according to government figures, though overall greenhouse emissions remained constant. The CO2 rise of about a quarter of a percent between 2004 and 2005 has met with dismay from environmental groups. The government says the rise was caused by increasing energy consumption and a switch from natural gas to coal. Earlier this week, the government admitted it was unlikely to meet its 2010 target for reducing CO2 emissions. Its climate change review said that current policy measures would bring a cut of 15-18% from 1990 levels, the commonly used baseline. Annual carbon dioxide emissions are now only 5.3% lower than in 1990, and have risen by about 2% since Labour came to power in 1997. Environmental groups say the latest figures provide additional proof that the government is failing on climate change. "Just two days after the government effectively abandoned its climate change targets, we learn that carbon dioxide emissions continue to be on an upward trend," said Keith Allott, head of climate change at the campaign group WWF UK. "Whilst Tony Blair continues to make fine speeches about climate change, he continues to fail to put his own house in order." WWF is urging the government to provide financial incentives through the European Union Emissions Trading Scheme (EU ETS) to push the power sector towards low-carbon technologies such as wind and tidal. But the climate change review, unveiled on Tuesday, made clear that the government has not decided how strong it will make incentives for the next round of the ETS, covering the years 2008-2012. In a separate announcement, the Department of Trade and Industry (DTI) has lowered a hurdle to the development of large offshore wind power by changing how connections to the national grid are financed. Now, rather than operators installing the connection and paying for it up front, grid companies will bear the cost. They will then charge operators an annual fee. "This is welcome news," said Richard Ford, head of grid and technical affairs at the British Wind Energy Association (BWEA). "The industry is delighted that the government has finally settled the regulatory framework for offshore wind." 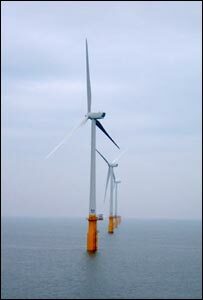 The first of these large wind farms will probably be the London Array, 20km (12 miles) off the Essex and Kent coasts. It will consist of up to 270 turbines, and the consortium building it hopes to begin operations by 2010 subject to gaining the necessary planning approvals.